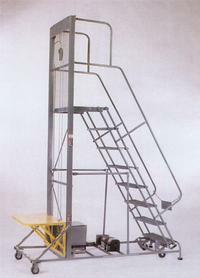 The Cotterman Lift Table Ladder provides powered retrieval and/or stocking at fixed shelving heights. Commonly used in Home Center stores for retrieving paint cans, the primary purpose is to handle dense items that are more efficiently lifted rather than carried. The unit is powered by two 6 Volt DC Trojan batteries with a Guest 10 AMP battery charger. Sizes offered are 5 step through 8 step. 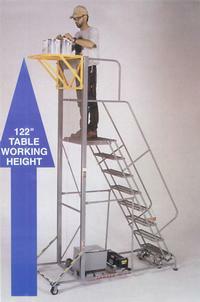 The following chart shows the usable working heights. This product ships only from the MI plant. Ships setup with protective crate.